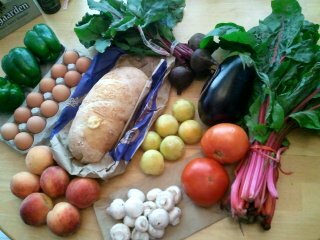 Week 6 in the Breezy Willow Farm CSA: chard, tomatoes, eggplant, beets, Shiro plums, mushrooms, peaches, green peppers, eggs, and bread (Great Harvest’s parmesan sourdough). I’m really excited about the tomatoes. Tomatoes, like strawberries, are absolutely stellar when they’re at that perfect peak-of-season ripeness. I like to cut them up and serve them as a side at breakfast, with salt and freshly ground pepper. My favorite items from this week, though, were the Shiro plums. 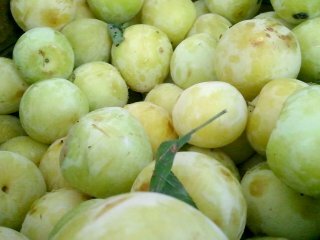 The pictures don’t really do them justice, but they’re a lovely pale golden color — a nice contrast to the little red Methley plums that we usually get. The flesh is sweet, but the skin is a little bitter. 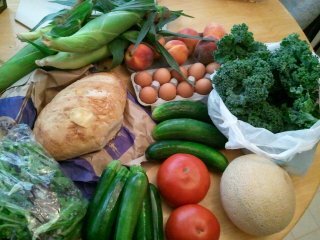 Week 7: corn, peaches, kale, cucumbers, cantaloupe, more tomatoes, squash, bag lettuce, eggs, and bread (parmesan sourdough again; I’m a sucker for that bread). For the squash ration, we could choose from zucchini, yellow squash, and patty pan. I went with all zucchini because honestly it’s my favorite, and it’s easy to prep for grill or fryer. I find yellow squash a bit bland, and patty pan is tasty but really annoying to break down. The cantaloupe was perfectly ripe, so we ate it right away. I hope we get more melons this coming week. I’ve been fortunate enough to escape the worst of this heat wave; my house didn’t lose power in the latest storm, and my workplace is heavily air-conditioned. But our hardworking farmers have been toiling away in the heat. Here’s our haul from weeks 4 and 5. 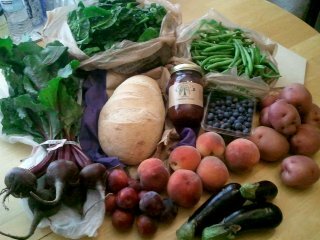 Week 4: beets, spinach, green beans, little baby eggplants, plums, peaches, potatoes, blueberries, bread (Great Harvest sourdough), and strawberry butter instead of eggs. The strawberry butter is fantastic, rich and sweet on sliced bread. 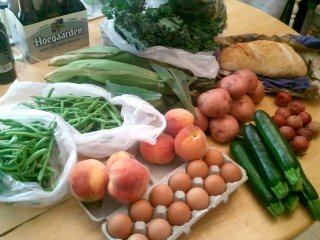 Week 5: more green beans, early corn, kale, peaches, potatoes, zucchini, plums, eggs, and bread (Great Harvest parmesan sourdough). For the Fourth, we kept it low-key; lit up the grill and blackened some zucchini and corn, along with some tasty steaks from Wagon Wheel Ranch. I love the summertime; I can just send K outside with some raw ingredients, and he brings them back with char and beautiful grill marks. 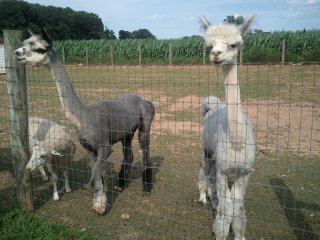 At the farm, the sheared llamas looked like poodles. With the weather we’ve been having, I bet they were glad to get rid of their wool. 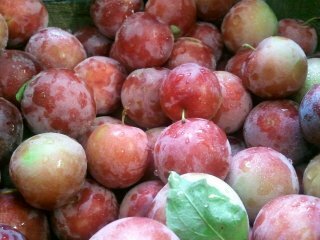 Also, this pile of plums at the CSA was beautiful. I love how they’re frosted with little drops of condensation, after being brought out into the heat. Things are supposed to get a little cooler after the weekend. Maybe then I’ll be brave enough to turn on the oven again.